I wrote this back in 2007, for my personal blog on MySpace. We were telling Christmas stories at work the other day, and I told my “best Christmas ever” story. After I told it, I thought it might make a good blog, so here it is. The location: Visalia California, the house on Divisadero Street, just down the block from the junior high I attended (now called a “Middle School” for reasons known only to the bureaucracy of schools). The year: 1971 8th grade Jim is 14 and knows Santa’s secret identity. Top item on the Christmas wish list: A 10-speed bike. Well, Christmas rolls around, and despite being a worldly wise and mature 14 year old (aren’t they all?) I had a bit of trouble getting to sleep Christmas Eve. I finally drifted off, and didn’t hear any commotion in the living room all night. The time: the crack of dawn, Christmas Morning. I sat on the end of the couch, and stared at it for probably 15 minutes. I just could not believe it. They had so completely convinced me that I was not going to get the bike that I was just totally blown away. I finally noticed that I was sitting there in my underwear, and I was starting to get cold. I decided to jump back in bed, so I made my way back to my bedroom. I laid there in bed for a few minutes, not even able to really believe the bike was there. 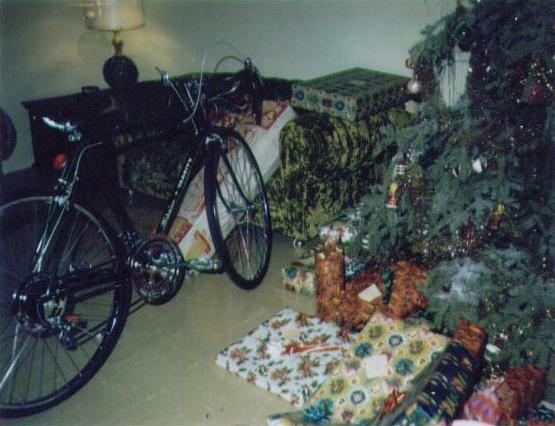 In fact, I was so afraid that it was just wishful thinking, or a dream, that I got up, went back into the living room and touched the bike, just to be sure it was real! I went back to bed for a while, and waited for everyone else to get up. While I lay there waiting, I was just in seventh heaven. I got my bike! That also set the stage for never completely believing my parents again when they said no….. but I don’t think they thought of that at the time! Oh, and the very first time I rode that bike, later that morning, I promptly ran into the back of a parked car, while trying to watch the gears change! Good Christmas holidays before and after, but this is the one that I will always think of first. I hope your holiday will be a good one.